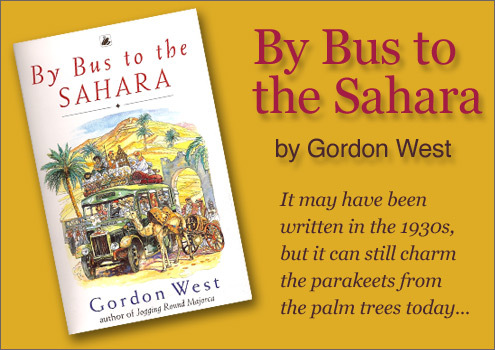 Without doubt one of the most charming travel books ever written, Gordon West’s classic By Bus to the Sahara follows the incredible journey undertaken by the author and his wife, affectionately referred to throughout as ‘the Spirit’, as they make their way – largely, although not exclusively – by bus across Morocco to the Sahara desert. Written in the 1930s, the colourful account overflows with charm and beauty, as it chronicles the Wests’ exploration of the land of palm groves and oases, mosques and muezzins, and the ancient walled cities of an old Empire – by bus. Setting off from Tilbury with two suitcases, a large painting box and a roll of artist’s canvass, they sailed to Tangier, and there entered the world of French Morocco, a world of sheiks and harems, the ancient Berber tribes of the Atlas Mountains, of French Legionnaires drinking ‘earthquakes’ in seedy desert bars, of beautiful old Moorish palaces and mountain mud villages. Born in 1896, West studied at the London School of Economics and served in the Royal Navy in the First World War. It was after the war he began his career in journalism, graduating to Foreign Correspondent for the Westminster Gazette in the 1920s, and becoming Foreign Editor of the Daily Sketch during the Second World War. It was in the late 1920s that, with his wife Mary, he decided to explore the then little-known island of Majorca, which was the inspiration for Jogging Round Majorca, the forerunner to By Bus to the Sahara. Improved with age, the latter leaves you gasping for more, wonderfully capturing the colourful, exotic and little-explored country of Morocco and the desert in a vanished era. No longer available new, the 1980s Black Swan edition can still be picked up very reasonably second hand. It’s well worth indulging in, and will transport you to a world of adventure which has long since vanished. A wonderful book! Two endearing travelers who are enchanted by all they see and everyone they meet, including the occasional negative experience. And they did their homework, as the saying goes, so passing historical insight into the regions they visit. This book most certainly deserves to be introduced to a wider audience. Getting to France from UK – Ferry, Train or Plane?